Making small tokens for house warming or weddings is easy with the Bitty Blossoms and Spellbinder dies. 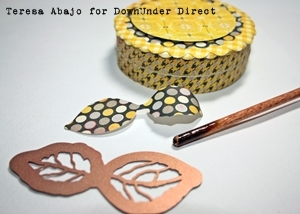 Today we have a tutorial to give a unique look to your Spellbinder Leaves. 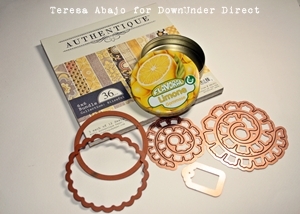 Cut leaves with Spellbinder dies from light weight chip board. Paint with gesso or white paint, allow to dry, or dry off with heat gun. Dab with distress inks, either the stamp pad or stains, what ever colour you like. I have used Peeled paint and crushed Olive Tim Holtz Distress Inks. Allow to dry or use heat gun. The combination of lace and music creates a wonderful card for any occasion. "I'm always short of a thank you card or two, so I've decided to make some cards in duplicate. It saves so much time making another while everything you need is already out on the desk." Here is a really quick page I made using the new JustRite Medallion Stamps and Custom Dies. Making the Bitty Blossoms is such fun, they are small enough to pop on any card. 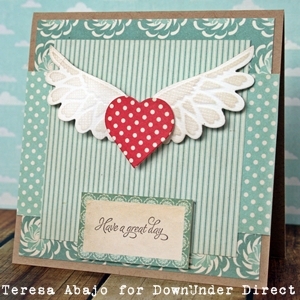 Here is another lovely card using the new medallion stamps and custom dies. "This photo of a mushroom after rain, appeared to be hidden in a dark grotto, this is the effect I wanted to achieve on the page, with spellbinder leaves it was possible." 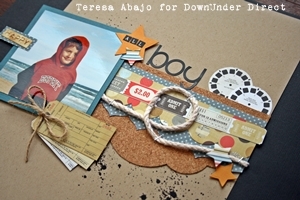 Today we have a layout from Teresa to share. "I found this sheet of cork, and wondered how it would cut in the Grand Calibur. No worries! It's as clean and crisp as if it were paper. 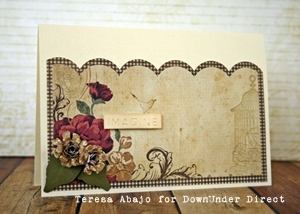 Spellbinders never cease to amaze me....."
Today we have a card made using some of the newest JustRite Stamp Designs. I love the look of the large background stamps. They go perfect with the Medallion Stamps. 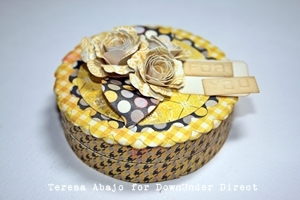 "This beautiful tin was too lovely to just throw away, so I thought I’d decorate it. You never know when you’ll need a little gift box at the last minute. From start to finish this took me around half an hour to complete, so it’s really quick." 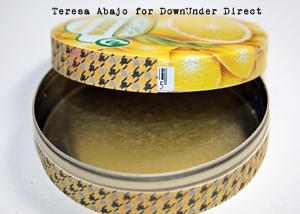 After sanding the tin lightly to give it some tooth for the adhesive to grab on to, cover the sides of the tin with strips of patterned paper. My preferred adhesive for this type of project is Gel Medium. 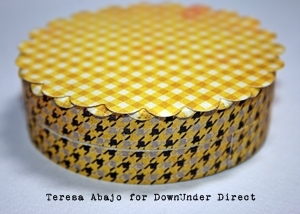 The scalloped circle I cut didn’t quite cover up the little gaps so the tin was still visible under the paper. I simply cut a second scalloped circle, and moulded the scallops over the edge of the tin. 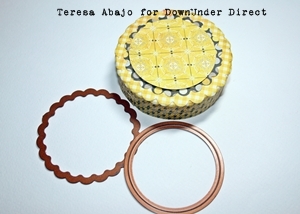 Cut a circle and scalloped circle to sit on the top of the tin, and adhere these in place. Cut some leaves from the Bitty Blossoms set, and curl them over the end of a brush handle. Adhere the leaves to the top of the tin. Cut some of the roses from the Bitty Blossoms set and assemble. Adhere these in place over the leaves. Cut a label from the Home Sweet Home set, and adhere a couple of the words from the Girlie Grunge set to it. Sponge the edges with some brown ink to bring out the detail, and adhere to the tin. 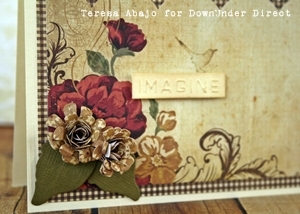 Today we have something a little different than our usual card projects, a lovely little tag. This elegant tag could be placed on a card as a House Warming gift. Happy Mother's Day to all the mums out there. I hope you are all enjoying your special day. In honour of Mother's Day we have a pretty, feminine card to share with you. "There was some subtle pattern in the background of this paper, so I thought I'd add to it by stamping a bird and cage in Frayed Burlap Distress Ink. It filled up the 'white' space without detracting from the flowers at the bottom left of the card." Today we have a card in the classic colours of red, white and black. Today I have a card to share using the new coordinating Medallion Stamps and Nestabilities from JustRite Stamps. With very little effort and limited extra materials you can create stunning projects in no time. 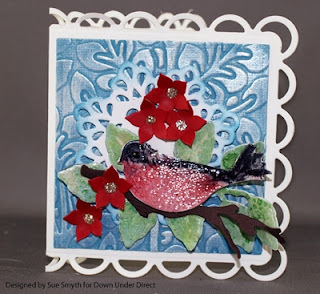 Today I have a card made using the new BLING-abilities and the new Spellbinder Die-Bitty Blossoms. Today's project is a bright and cheerful layout from Sheree. 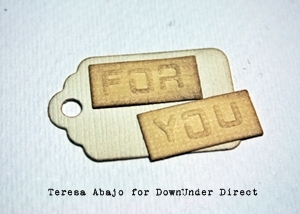 We are pleased to announce a new call for more design team members for DownUnder Direct Wholesale. While we have a fantastic team already, we would like to extend this invitation. Our extra design colleagues will have the privilege of not just designing with any scrapbook item but will partner with the industry’s leading quality and superior products. These will include the Pinnacle Brands of Bazzill Basics Paper, Spellbinders, Le Crystelle, Swarovksi, and JustRite Stamps. Please read the following information to apply for this design call or pass this onto anyone who you feel would be suitable to submit design work to us. Be computer savvy to be able to upload and/or email completed work to your Team leader. All submissions must be your own original work. You must NOT own a profit/trading craft business however you can be an employee in the industry. Via email only with images not larger then 2MB each image. Please send us four items: 2 x card samples 2 x layout samples. How will I be paid for my on-going monthly work? This will be discussed with you if you are selected but rest assured that our current Design Team members chose to continue on with us after their first year ..hey we must be doing something right. No… round one is simply samples of your work for us to choose you to move to round two. If you qualify to round two we will then begin to ask for specifics. Yes. Please include in your submission a short reason why you feel you would like to be on our team. Yes you MAY be asked to design work for our product advertisements if required. Yes you will be required to report to a team leader/co-ordinator. This card created with the mixed media set and shows you can use elements from different packs to create a sweet little card. "This is a cute little 'pick-me-up' card. After embossing and sponging the wings with some brown ink, I gently curled them over my finger to give them dimension. They are glued down only at the tips, and the heart is adhered over the top with a couple of 3D Zots to give it height." 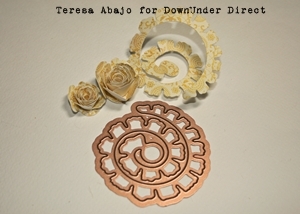 Today's project features another of the new Cut Fold and Tuck dies-Spectacular Spin.